Such is the case of the Stealers Wheel Colony stuck in the hoarder home in my neighborhood that I wrote about in December. When I was there I counted up to 16 cats, 2 birds and a chihuahua. My original plan was to help this house get all of the cats fixed, and ultimately adopted or placed into shelters. Kittens are routinely being born and disappearing from here, cats are outside, and I’ve been TNR’ing a colony across the street from there since 2009. I don’t doubt some of those outdoor colony cats are from this house. So, since December, I was able to TNReturn some of the cats there, and my neighbor managed to get two of them adopted out to other neighbors. 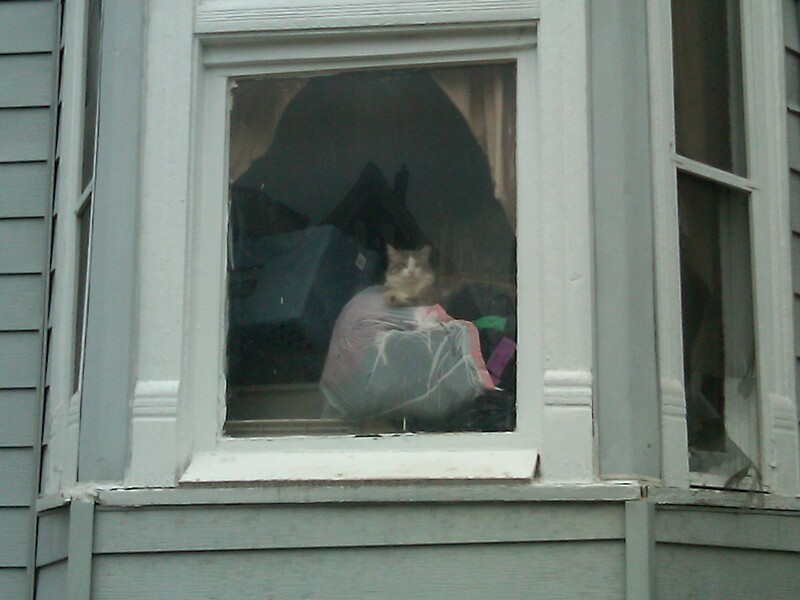 I was jogging by there in January and saw one of the ear tipped cats in the window. I was excited to see him and he looked pretty good, despite the fact that he’s in a house filled with chaos, feces, and garbage stacked to the ceiling, while being fed sporadically and receiving no medical care. Allen, one of the cats’ “owners” came out. He said that the cats that I fixed all got sick and died. When I asked about the cat in the window, he just said “except for that one.” Christina came out next. She appeared angry and I felt physically threatened by their behavior. They were accusing me of getting the cats sick, but at the same time asking me to come back and get them fixed and adopted out. It was scary and I decided I could not go back there alone, or even with help. My original plan was not going to work anymore. This had to be handled by authorities. It has been very difficult to get a response here. Every local organization I can think of is aware of this house. Another organization called Triple R Pets that covers TNR outside of the city in the southwestern suburbs suggested I call Dr. Donna Alexander, the Administrator for Cook County’s Animal and Rabies Control. They said she will be able to help. I called Dr. Alexander and got a response within two hours. Chicago Animal Care and Control has been sent again to investigate further. The cats cannot keep breeding like this over there. Also, Christina and Allen need help. The house is not habitable for animals or people. I’m glad they all may finally get the help they need. I’m thankful for Dr. Alexander’s expedient response so far. She is a rock star. She has a dog named Leroy Brown! I hope I never encounter a house like this again in the future, but if I do, I now know who to call. Thank you, Erica! This has been quite the learning experience.